Just over 10 years ago we moved to Japan. Out of all the places I’ve lived in my life (33 residences) Japan was by FAR my favorite. It’s gorgeous, and felt like home in a way that was so natural it’s hard to describe. ANYWAY, it was SO exciting, moving overseas. We got picked up at the airport by someone from my husbands work, and they took us to our apartment, shopping, setting up our phone/internet, etc… Then they left us and we were on our own! just like that! Alone! Before we moved there I was worried that I would have a hard time with food, in fact we shipped a TON of american food over to make sure we had what we needed. Homes and apartments don’t even HAVE ovens – so everything is cooked over the stove or eaten raw. And I obviously love to bake! 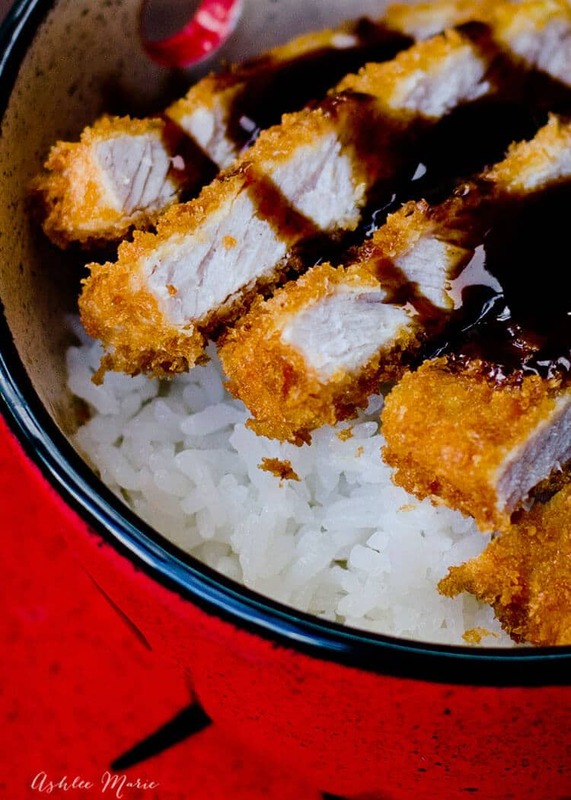 So for our very first meal we walked to an internet cafe and my husband ordered Tonkatsu and Katsudon – stating he was sure it was something I’d enjoy! and oh MAN was he right! 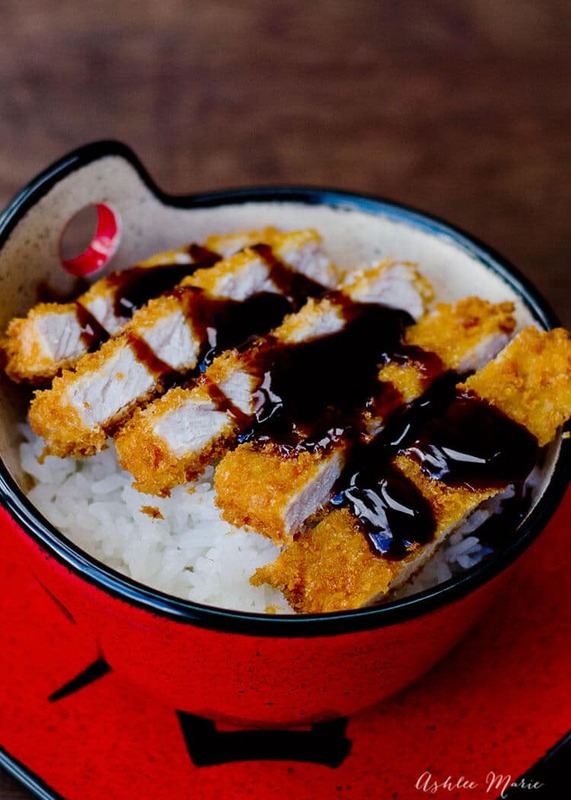 you can get the recipe for the Katsudon over here. But SERIOUSLY how easy and how delicious does this look! 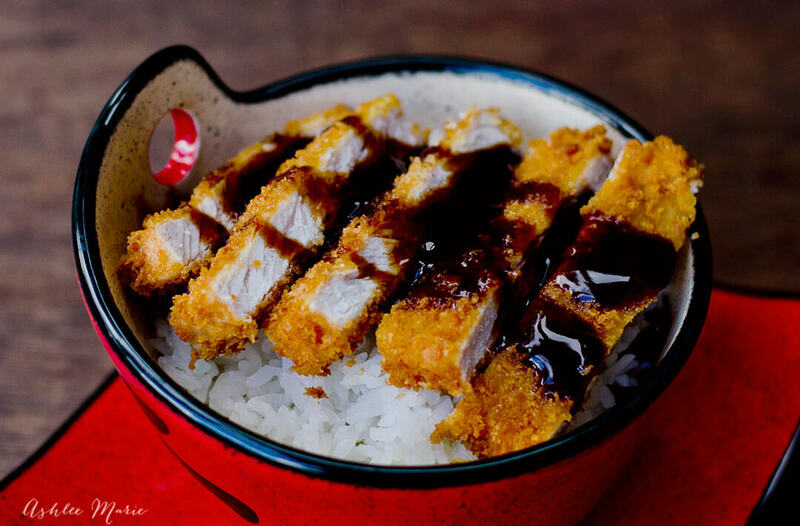 rice, pork, breading, fried food and a tangy sauce! HEAVEN! 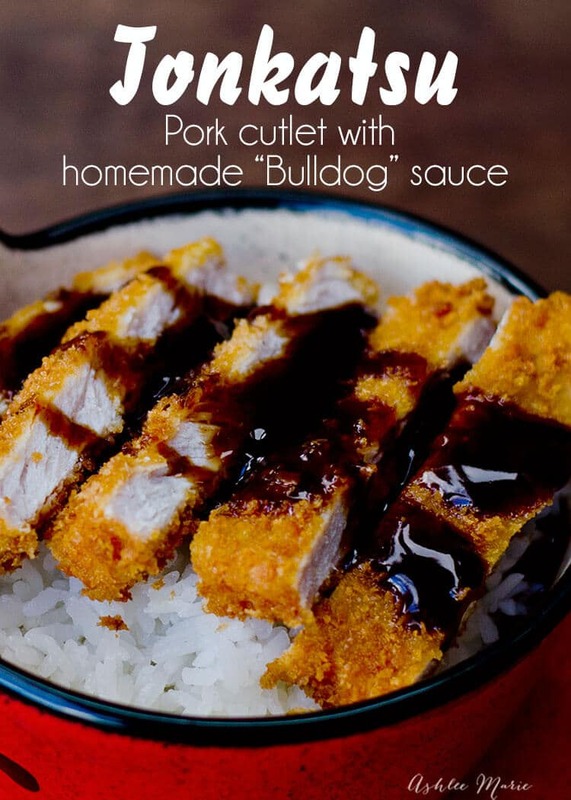 Now if you don’t want to make your own sauce you can buy Tonkatsu sauce – the best brand is “bulldog” and it’s SOMETIMES at normal grocery stores, but always at Asian stores. But making it is SO easy! A from scratch Japanese bulldog sauce with breaded pork cutlets over rice. Heat a few inches of oil in a large saucepan on medium-high/high. When you add a drop of water it should bubble a lot. Pound out the pork chop evenly, about double the width and half the thickness. Dip both sides into flour and shake it off. Then dip both sides in the beaten eggs, let the excess drip off. Cover both sides completely in the Panko bread crumbs. Then fry the pork cutlet in the hot oil, about 1-2 minutes on both sides. It should be golden and cooked through, if it's too dark turn the oil down. Place on paper towels over newspaper to drain. In a saucepan cook the worcestershire sauce, sugar, soy sauce and ketchup. So there you have it! what are your favorite ethnic dishes! We LOVE ethnic food and make it all the time! I really should share more! what do you want to see more of? Mexican? Indian? Greek? let me know! Beautiful pictures Ashlee! And a great write-up. Wow, 33 residences, that is a lot! I too am a big Tonkatsu fan. Well done! yup, all before I was 32! It’s been nice to be so stable for the last 4 years! And thanks! I’ll share my sweet egg topping for Katsudon soon too! Why did you not season the pork? That’s not how they do it in Japan. Never occurred to me to do it.